Object States Assistant (OSA) adds new functionalities to multi-state objects and improves the multi-state objects user experience. OSA improves states navigation, it also allows you to add objects to specific states, as well as remove and release multiple states in a single operation. Improves state navigation by using buttons, menu items or keyboard shortcuts. Adds objects to all states in a single operation. Adds objects to multiple states in a single operation. Pastes objects into all states in a single operation. Removes multiple states in a single operation. Releases multiple states in a single operation. Retains the “State” actions after Copy and Paste. Adds an easy way to increment the state of a “Go to State” button action using “Step and Repeat”. To update to the latest version of OSA, download the trial version (even if you have a licensed version) and follow the installation instructions. • Version 1.0.0 - Initial release (06/03/2014). 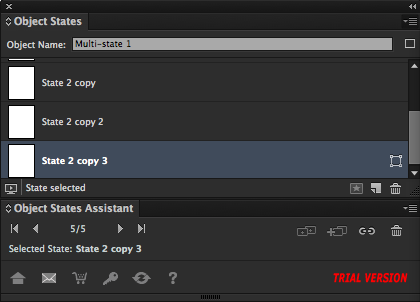 The trial version limits the number of objects that can be added to states. OSA is platform independent; the same software will run on Adobe InDesign CC on the Mac OS or Windows. You can purchase Object State Assistant directly from our Web store. eSellerate Inc. is our eCommerce partner and will provide payment services, receipt and serial number delivery. After purchasing OSA you will receive an email with the receipt of your purchase that will also include a serial number and the software download link. The serial number will be used to unlock the limitations of the trial version. If you purchased multiple copies in a single order, you will receive a single serial number that will activate as many copies you have purchased. To print a receipt from an order or access order history visit eSellerate After-Purchase Services or contact support@automatication.com. The version of OSA you are using. The version of Adobe InDesign where OSA is installed. The operating system you are running on your machine. Adobe has discontinued Adobe Extension Manager, it means that you cannot install Multi-Find/Change in Adobe InDesign CC 2015. If you try to double-click on the file, you might get the following message; “Install_OSA.command” can’t be opened because it is from an unidentified developer." After double-clicking on Install_OSA.bat , depending on your user account privileges you might get an OS dialog asking to authorize the installation. 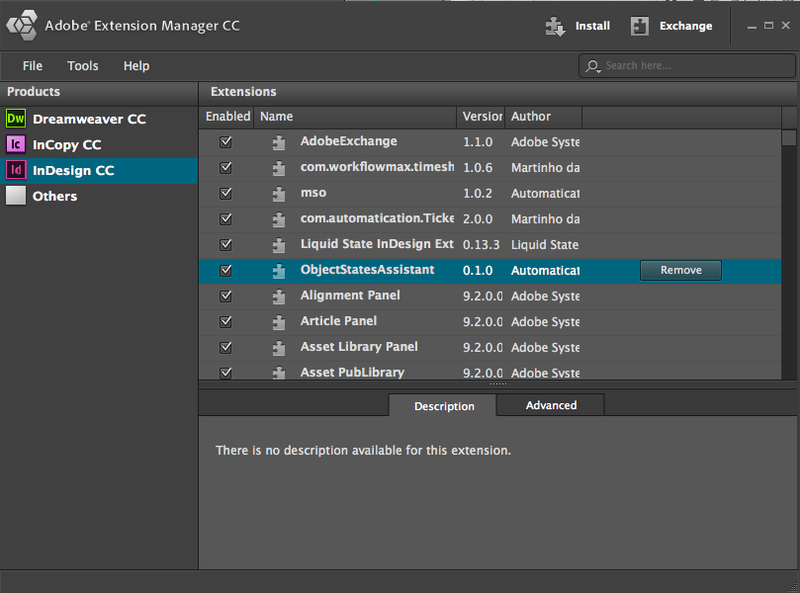 To install Object State Assistant extension, you must have Adobe Extension Manager CC installed. 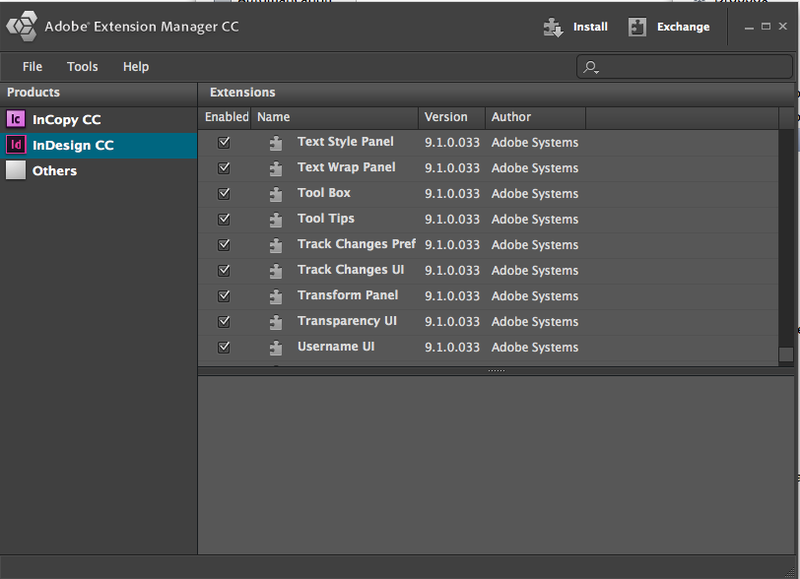 Adobe Extension Manager provides an easy and convenient way to install and delete extensions in Adobe applications. 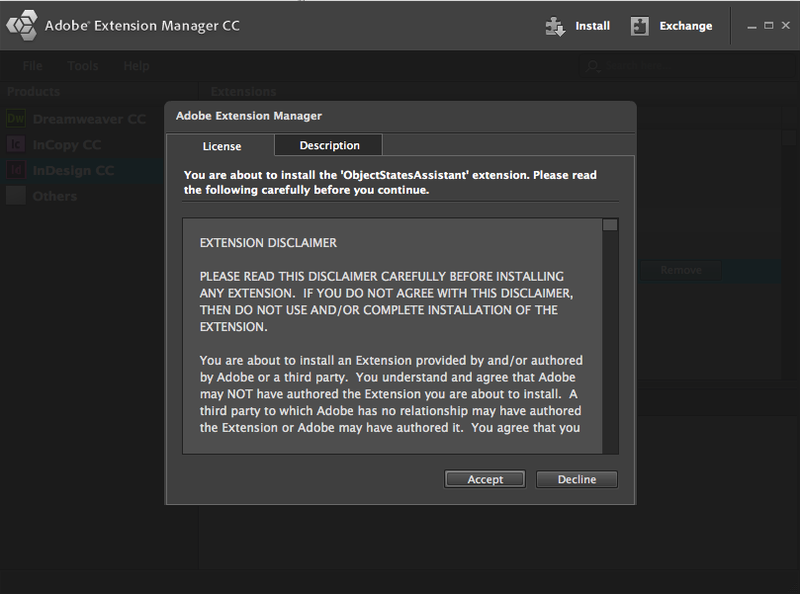 Adobe Extension Manager CC can be downloaded from Adobe Creative Cloud. if you have older versions of Adobe InDesign installed, you will probably also have older version of Adobe Extension Manager, so make sure that you open the correct version CC. • Select Adobe InDesign in the PRODUCTS section. • Double-click ObjectStatesAssistant.zxp file (inside the folder ObjectStatesAssistantCC) in Windows® Explorer (Windows) or in the Finder (Mac OS). • Object States Assistant extension should appear immediately in the extension list. After purchasing OSA through our Web store you need to activate the plug-in using the serial number you will receive via email. You should keep the serial number in case you ever need to re-activate OSA (if you change computers, or reinstall the operating system, for example). To activate OSA you need to enter the serial number in the trial version of the software. The trial version will become a full working version. The trial version can be downloaded from this page. If you have ordered multiple copies in a single order, you will receive a single serial number that will activate as many copies you have purchased. The license is computer based, which means that you can activate Adobe InDesign if they are installed in the same computer. After purchasing OSA, you will need to wait about 20 minutes for the activation servers to be update. You might get the error message "Unknown Serial Number" if the activation servers are not updated. 1 - Start Adobe InDesign. 2 - Choose Window > Interactive > Object State Assistant, to show the panel. 3 - Click the Activate/Deactivate button and then enter or paste the serial number. 4 - Click the Activate button. When OSA is successfully activated, the serial number is displayed in the lower right corner of the panel. If you have activated OSA and want to move the license to another computer, you need to deactivate OSA. 4 - Click the Deactivate button. Once OSA has been successfully deactivated, it will default to trial mode ("Trial Version" will appear on the lower right corner of the Object State Assistant panel). You are allowed a maximum of 3 deactivations.